» Articles » Sharp Tips » What Type Of Fertilizer Is Best For Vegetable Gardens? What Type Of Fertilizer Is Best For Vegetable Gardens? Take a look at the various types of fertilizers available at your local garden center and you might quickly become confused or unsure as to the right product to purchase for your intended purposes. As a quick overview of the fertilizer numbers code, we know that the first number represents the percentage of Nitrogen (N) in the bag, the second number represents the amount of Phosphorus (P), and the third number stands for the amount of Potassium (K). Nitrogen produces a lot of leafy greenness, or topgrowth, in plants--Phosphorus encourages healthy root development, flowering, and fruiting--and Potassium aids in cellular function and plant hardiness and disease resistance. Knowing this general information, we wouldn’t go wrong by using a balanced agricultural fertilizer (like 10-10-10) on our vegetable garden, thus feeding our plants equal doses of Nitrogen, Phosphorus, and Potassium that would enable them to carry out their business of producing vegetables for us. But, we can do better! We can use specialized plant foods that are manufactured specifically for the purpose of feeding our vegetable plants (and flowers, trees, and shrubs for that matter) just what they need for maximum productivity. Two of the better specialty plant foods that come to mind are Osmocote ® and Miracle-Gro ® All Purpose Plant Food. Not only do these products have the right balance of N-P-K, but they also contain additional trace minerals and nutrients like copper, iron, manganese, zinc, and boron, that insure healthy productive vegetable plants in your garden. Osmocote ® comes in a pelletized form that is easy to work into the soil while you are setting your plants. The pellets allow a slow release of the fertilizer into the soil (and thus into the plant roots) so that your plants receive a constant feeding of nutrients for a time period of up to 4 months. 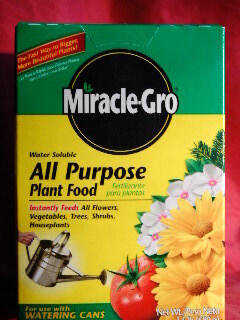 Miracle-Gro ® All Purpose Plant Food can be mixed with water and then poured onto the soil around the plant roots--thus watering and feeding the plants at the same time. This product may also be applied using one of the hose-end type sprayers, which will allow for easy watering and feeding of a larger number of plants in a relatively short time. Other products are available for purchase that will boost the productivity of your vegetable garden--such as fish emulsion fertilizer, composted cow manure, and other organic blends that may include seaweed and other natural products. And, If you have a compost maker of your own, by all means add homemade compost to your vegetable garden to boost the fertility, looseness of texture, and overall organic richness of your soil. This increased fertility of your soil will help feed a steady supply of nutrients to your plants.